As much as I’ve always advocated trail running as a place to find inner peace and solitude, I would never go so far as to say that running with others and ‘peace and solitude’ are mutually exclusive. In fact, one could argue – and I would be quick to do the same – that connecting with other like-minded people is a form of enlightenment that deserves mention right up there with meditation. A couple of months ago I joined a website called Meetup, which is a social networking site comprised of many different interest groups. I registered so that I could specifically join one of its groups called “New York Trail & Ultrarunning,” and I began logging on periodically to get an idea how the whole Meetup concept worked. 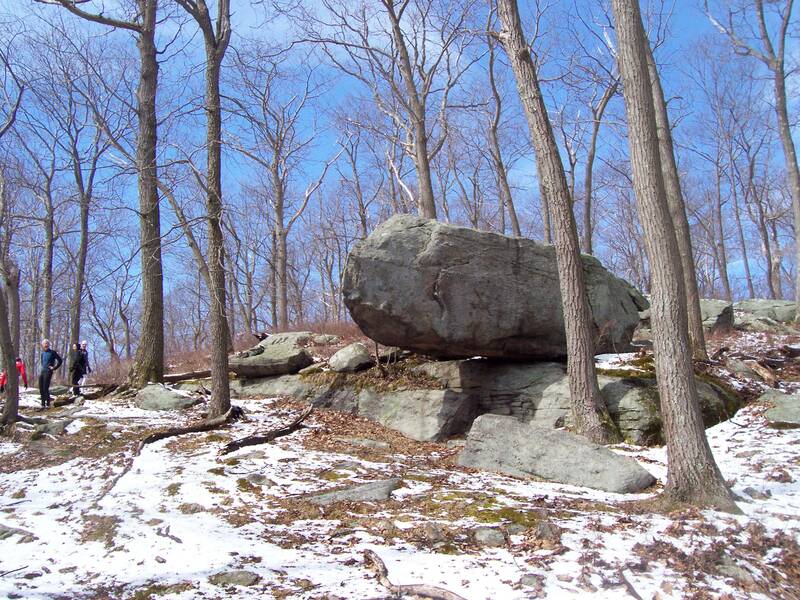 Once I had that figured out, I posted my very first Meetup – a Harriman State Park trail run, designed as training for the upcoming North Face Endurance Challenge at Bear Mountain, and I was so glad that I did. Almost immediately, other Meetup members began RSVPing, and before I knew it, we had six or seven avid runners signed up to run with me. That group, coupled with two friends outside of Meetup who I had invited to run with me as well, made for an especially nice assemblage of runners. As the run date neared, we all exchanged comments on our Meetup event page, getting people even more juiced up for the run than ever! 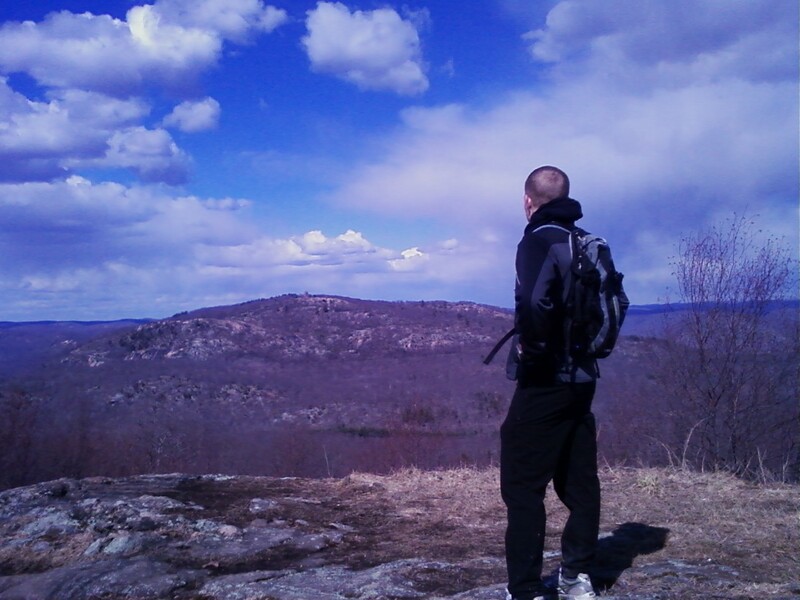 Well, the day finally came, and I arose on April 2nd to get ready to pick up four New York City runners who would be arriving at the Metro North Manitou station, just north of the Bear Mountain Bridge. Joining me were Brian, Michael, Mario and Anthony. 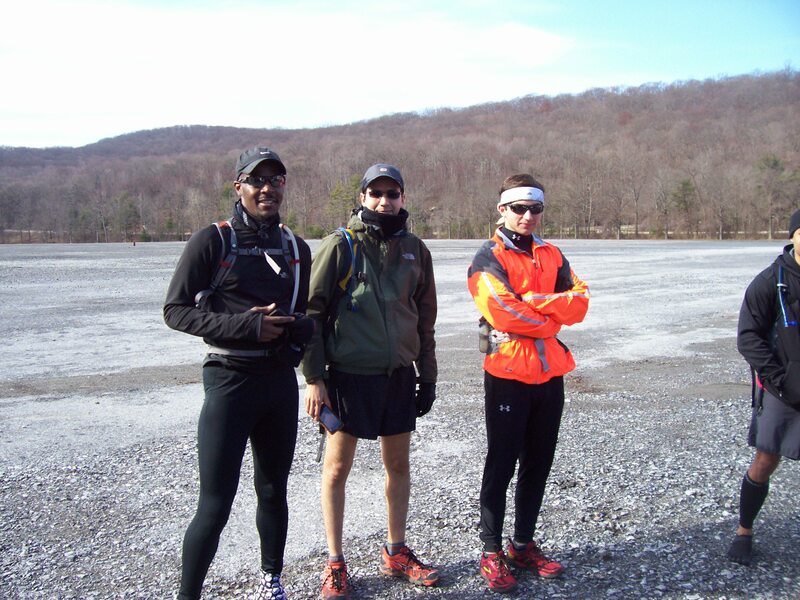 All avid runners, and not afraid of rocks, mud and the heavy climbs that are the typical makeup of a Harriman trail run, these guys were ready to go when they got off the train. Anthony is a Manhattan westsider, having moved there not long ago from New Jersey (Summit, if memory serves). He’s young, was hungry to ‘go long’, and he wore a white bandanna around his forehead as a symbol of his intrepid style. Michael – also from Manhattan – was an experienced trail and ultrarunner, telling me he had run in the Escarpment Trail Run at least twice, and also the North Face 50 Mile race last year. He was prepared with all the right gear, right down to his skull-adorned gaiters! Michael brought his friend Mario along with him as a guest for this Meetup, and I wasn’t clear how much experience Mario had on trails, but I guess we would soon find out. And last from the NYC group was Brian, who had joked with us from the beginning that he would wear his Vibram Five Finger shoes, despite the recommendations against such a choice that Michael and I had put out there. Brian brought a bottle of whiskey with him for what he said was to kill the pain of running in the Vibrams over the rocky terrain. Only half serious about it, he would find out real fast that these trails were some serious business! Also joining us at the train station was Mike, one of the Admins of our Meetup group. Mike lives in the Hudson Valley, over in Croton-on-Hudson, and helped me shuttle the runners over to our start at the Anthony Wayne Recreation Area. Upon arriving at Anthony Wayne, we saw Mark (another Meetup member), who drove up from West Orange, NJ to join our run. 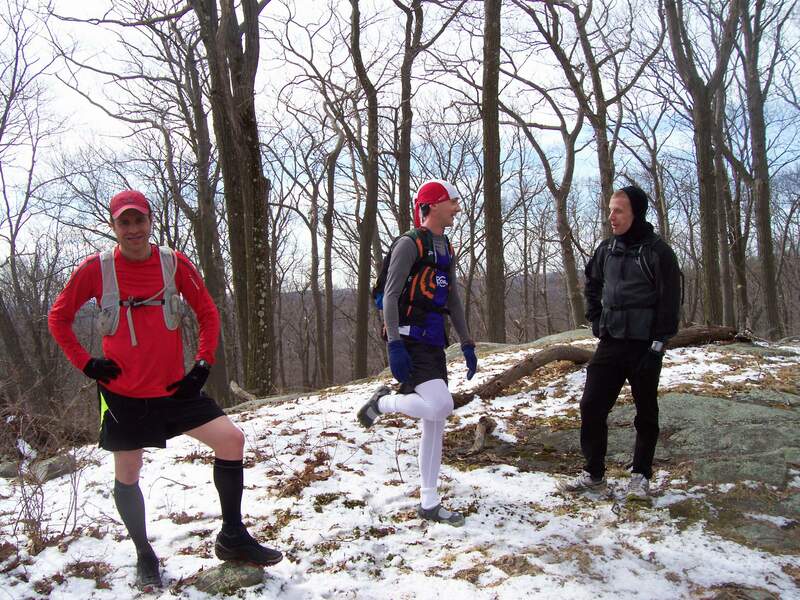 Mark has run some pretty good races in the recent past, it turns out, including races in the NJ Trail Series, hosted by Rick McNulty. Also joining us at Anthony Wayne were my friends Paul and Patrick. Paul drove up from the city kind of at the last minute. He and I met earlier this year, and had done a few long runs together over the winter, including a 32-mile run around Manhattan back in late January. And Patrick was one of the folks I met by virtue of my Harriman trail run project last year, and this would be our 4th time running the trails here together. Anyway, so now there were ten of us, and as we made our way up the trail, we encountered a very technical section almost immediately. Perhaps in honor of my distinction as the event host, the group allowed me to assume the lead position, and Patrick joined me up front, setting a pretty fast pace up this first rise. Thinking the pace too fast, especially with Denis and Brian in their VFFs, I quickly jumped in front of Patrick and then dialed back the pace a bit. After the group ‘break’, we carried on in a southerly direction on Seven Lakes Drive. Mere minutes later, we hung a quick left onto Silvermine Rd, a typical woods road/ski trail here in the park. From here we began the steady climb up into the pass between Black and Letterrock Mountains. The road is fairly flat at first as it skirts the eastern edge of Silvermine Lake, but then a twist and turn later we were in full climbing mode. Knowing that we had another turn to make up ahead, I jumped into the lead, and as we finally reached the junction of the Ramapo-Dunderberg Trail, I stopped so that everyone could assemble together again before moving on. This, as it turned out, would be our MO for the next 8 miles. As we made our way up this next segment of trail, we surpassed the 1,000 foot mark in elevation, and encountered our first snow. It wasn’t a lot of snow, but it was enough to give everyone a sense of what early Spring trail running in the mountains is like. A short, sustained push brought us quickly to the William Brien Shelter, at the intersection of the Menomine Trail. 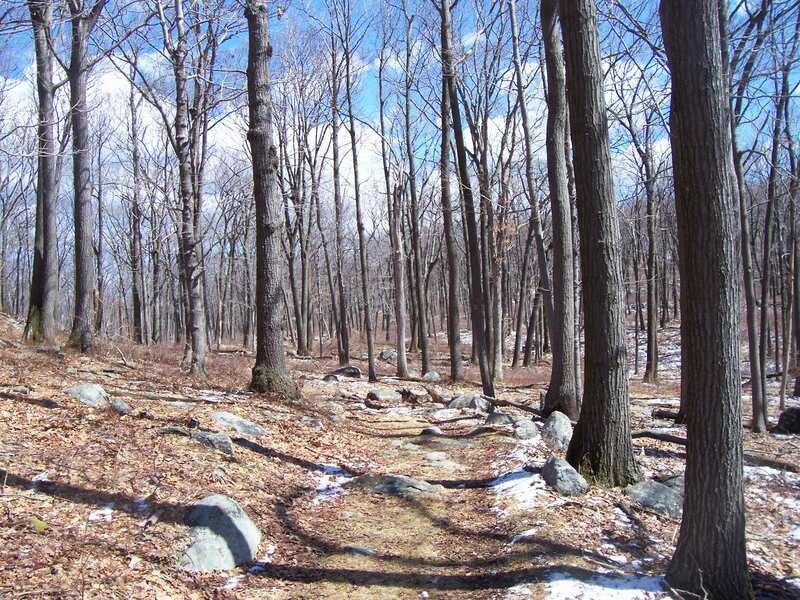 There was a short but treacherous descent to the shelter, which gave some of the less experienced trail runners their first taste of the highly technical stuff that Harriman State Park can dish out. A right-hand turn from here onto the yellow-blazed Menomine took us on our way down the northern face of Letterrock Mountain. The going was very technical for the first half mile before finally smoothing out when we reached the shoreline of Silvermine Lake. It was during this section that we began seeing our first day-hikers, a string of 10 or 12 people who had apparently begun their day from the Silvermine Picnic Area. Minutes later, we would be there ourselves, and we stopped for a few moments to allow our group to reassemble, and as we did, we chatted about the old abandoned ski hill that lie here at the base of the mountain. With 4 or 5 miles under our belts now, we exited the Silvermine area, crossed over Seven Lakes Drive, and began what would be a long trek up and along Stockbridge Mountain. At the northern shore of Lake Nawahunta, we made a right turn onto the Nawahunta Fire Road. This was my first time ever on this trail section, and it’s essentially a long, slow climb up into the clove between Stockbridge Mountain and Cranberry Hill. As we traversed this stretch, while Denis and Patrick assumed the front of the pack, I had a chance to speak to Mike for a short while about the things I had been doing with my running and writing over the past year, and also about the crazy series of events that resulted in my meeting Marshall Ulrich in late 2008. And as Mike spoke to me about his own story and his philosophy about running, it struck me that this was a person who really “got it” in a spiritually healthy way, and I knew that this was only the beginning of what would probably be a long-term dialogue between us. After almost a mile on the fire road, we reached the junction of the Long Path, and upon turning left, began a three and a half mile run along Stockbridge and Fingerboard mountains. 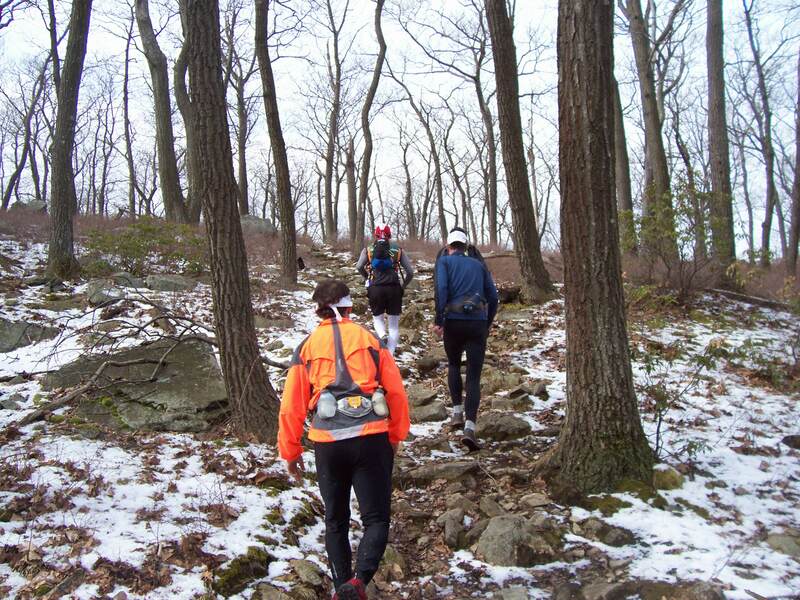 As we ran here, we continued to climb, and we also saw snow again. Even more than we saw on Letterrock Mountain, in fact. By the time we were done climbing, we were at over 1300 feet, almost 900 feet higher than when we started. One spot along the way had us doing a hand-over-fist climb on some snow covered rocks, bringing the run to almost a dead halt. But with some perseverance, we made it over the rocks, and through the snow, and all the way to the Stockbridge Shelter, where a beautiful panoramic view of the rest of the ridge was waiting to entertain us. There were a couple of overnighters who had taken their refuge at the shelter, and they had a warm fire going as they smiled at us and sipped their morning coffee. In the biting wind here on the mountaintop, it was tempting to hang out with them, but alas, there were still many miles to cover, so after some quick small talk with these two adventurous men, we got on our way once again. We made fairly quick work of finishing the rest of this long ridge, passing Hippo Rock along the way, and also stopping for a view across the valley of the Arden House, the large mansion that was originally built by the Harriman family in the early 1900’s. 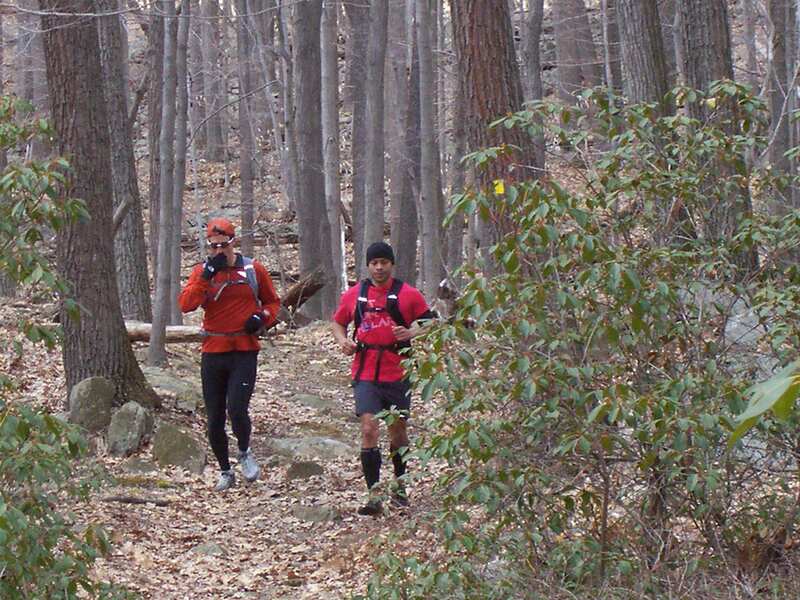 There were a couple of dips and climbs to negotiate, especially after we connected with the Appalachian Trail, but we eventually made it to Arden Valley Rd, the location of the 14-mile checkpoint of the North Face 50-mile and 50K races. After successfully traversing the bog, we did manage to make it to the R-D Trail without too much further ado, and from there it was a fairly easy run (with a lot of downhill) all the way to the junction of Bockey Swamp Road. I was running with Michael, Paul, Brian and Mario at this point, and our group had lost contact with the fast bunch that included Mike, Denis, Patrick and Mark. When we all arrived at the next junction, we decided that with only about 4 or 5 miles left to go back to the parking lot, we should permanently split into two groups. Patrick would lead the front group, and Damon would stick with them, while I would lead the second group, hoping to heck that I would be able to find the unmarked woods roads that were part of the 50K course. And so off we all went, and to second a comment that Mike had made earlier about Bockey Swamp Road, it was not very easy to follow, and had a degree of bushwhacking and climbing over downed trees along most of its course. The road terminated at the Menomine Trail, and I was once again back in familiar territory. We were about halfway between the Brien Shelter and the junction of the Red Cross Trail. As Paul, Brian, Mario and I navigated the techn ical downhill here, I shared stories of when I had run here in August, and of the living hell that the Red Cross had been for me throughout the summer of 2010. At the Red Cross trailhead, we turned left, crossed a small bridge, and then made our way toward Big Bog. The trail all through here was wet, but decidedly not as wet as it had been two weeks earlier when Patrick and I had run in this area. With some diligence, I was able to find our turn onto Owl Lake Rd, and I was quite surprised (and even remarked so to Paul) that there was actually a lake of sorts here. From the map I was led to believe it was more of a wetland than anything else. Anyway, the running here was fairly easy, and Paul and I set the pace as Brian and Mario followed closely behind. At one point the road became mostly dirt and straw, and as Brian and I were running shoulder-to-shoulder, he suddenly stopped and yelped in pain. The poor guy had stubbed his pinky toe on an invisible rock or stick, and it seemed all he could do to keep a smile on his face (but he did!). After all the technical running we had done, it seemed inconceivable that he had hurt himself along this, the flattest and least technical of spots we had run so far. Ugh !! After taking the time necessary to shake it off as best he could (he was in a LOT of pain), we moved on, but not before realizing that we had somehow lost our way. I don’t know how it happened, but we had missed a left-hand turn for the 1779 Trail, and were now almost to the Palisades Parkway. I looked at the map, and then looked at it again. I was not sure where we were. And since I couldn’t be sure how far back we might have to go to find the turn we had missed, our group decided to continue out to the road, and then run along the roadside while trying to find our way back to the 1779 Trail from there. Well, it never happened, and before we knew it, we were passing the park’s Visitor Center. From here, it was perhaps ¾ of a mile back to the Anthony Wayne Rec Area, so we decided to just stick with the roadside the rest of the way. We stripped off our wet clothes in favor of dry ones, and to celebrate a job well done, we broke out the beers – Brooklyn Lager and Long Trail. 🙂 Brian took a snort from his whiskey bottle, and in a show of solidarity, I joined him. I don’t know if Jack Daniels made the pain in his pinky toe go away, but it was a good start. 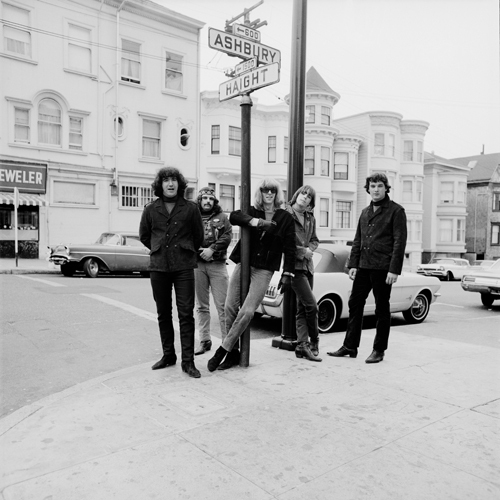 Eventually the others all returned, with Anthony at first (who had cut his ‘extra’ run short), and then Mike, Patrick, Denis and Michael. Almost everyone partook in the liquid bread that I had brought along, and after we had sufficiently recapped the enjoyment of the day, folks began making their way home one by one. One of the last to stay was Mike, who was still jonesing to do some more miles, believe it or not. He asked me if I wanted to join him, and despite the fact that I had already had a beer and a shot, and was halfway through another beer, I said yes (to my own surprise). So I closed the trunk of my car, locked up, and Mike and I made our way up the Anthony Wayne Trail, onto the Fawn Trail, and then followed the Timp Torne Trail up onto West Mountain. I bitched about the climb, blamed my shortness of breath on the beer and whiskey, and Mike was gracious enough to tell me that if the run was too much for me, that we could just hike. Wow, how about that!? Despite his offer, I sucked it up, and we ran it all the way back down the mountain and back into the parking lot again, chatting it up about some of our common experiences and acquaintances as we scurried along Beechy Bottom Road. I was a bit sad that this wonderful day had to come to an end, but just as with all things, it is a part of my experiences now, and hopefully an experience that I will revisit again…. 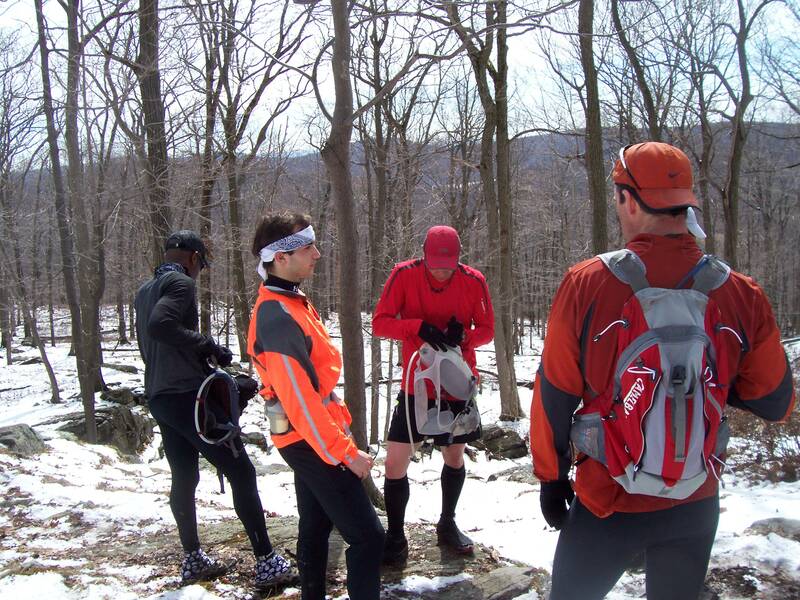 This entry was posted in Trail Running and tagged 1779 Trail, Anthony Wayne Recreation Area, Harriman State Park, Long Path, Meetup, North Face Challenge, Ramapo-Dunderberg Trail, Red Cross Trail, Silvermine, trail running, West Mountain. Bookmark the permalink. Owl swamp/ lake was one of those CCC projects that were never completed. There was a concrete dam built at the southern end, which was destroyed in the late 1980’s. The proposed name for the never finished lake was to be “Ookwae”, an Indian name for “Bear”. Next time, remember to “Ookwae” left on the 1779 trail Todd! I won’t miss it next time, Patrick. 😉 Ookwae, ookwae! !